Thompson, Margaret Mae (née McQuarrie) passed away in Brampton on April 7th, 2018. Marg was born May 11, 1934 to John and Eva McQuarrie in Glen Williams, ON. 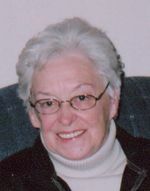 Beloved wife to the late Norval Clinton Thompson and loving mother to Darryll (June), Lynne (Kevin), Rick, and JoAnne (Michael), as well as a loving grandmother and great-grandmother. She was infinitely proud of her five grandchildren Cory, Sean, Tyler, Emma, and Sarah and always adoring of her six great-grandchildren Quintin, Olivia, Ryan, Aden, Owen, and Piper. One of seven children, she is survived by Nadine and Donna and predeceased by brothers Bruce and Jack and sisters Eileen (Fudge) and Gloria (Cook). She was a caring aunt and great-aunt to her nieces and nephews and a loyal friend to all who knew her. She is now having a reunion with family and friends that she has not seen in a long time, in a place where laughter and love is guaranteed. Marg remains in the hearts of her family and friends. Friends and family will be received at the Ward Funeral Home (52 Main St. S, Brampton, ON) on Thursday, April 12th from 4pm to 8pm . The family invites friends to celebrate her memory on Friday, April 13th at 11am in the Chapel.